With the development of agricultural technology, fertilizer production technology advances, and the new fertilizer like compound fertilizer is use more widely. This paper introduces the fertilizer production technology and production processes of compound fertilizer production line, as well as the required compound fertilizer production equipments or Compound Fertilizer Production Machinery and organic compound fertilizer machine. There are many kinds of compound fertilizer production processes, and common production processes are: spray granulation, tower granulation, drum granulation, etc. Rotating tower granulation can be used to produce nitro compound fertilizer, and its advantage is that the direct use of ammonium nitrate can eliminate the need for spray granulation process and simplify the production process. 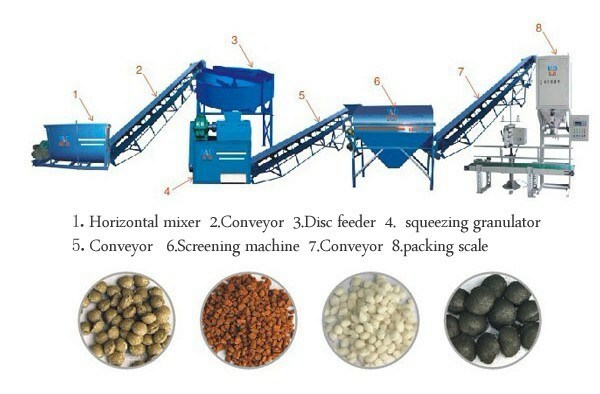 Drum granulation is also can be called as tumbling granulation, so the drum granulator is the most widely used in compound fertilizer making machine, with relatively small limits. Only 2-3 million can offer a compound fertilizer production line, with daily output up to 280-400 tons, even more than 500 tons, so it’s favored and widely used by many compound fertilizer machine manufacturers. Fertilizer production process has the following steps: Raw material burdening, raw material mixing, particle granulating, particle drying, particle cooling, particle grouping and particle packaging. Required equipments generally are crushers, belt conveyor, granulating machines, elevator, finished product screening and other equipment. Henan Fote Machinery Co., Ltd. is professional in production of compound fertilizer production line equipment, and Fote experts can design and adjust production programs depending on the actual requirement of users, and responsible for the installation and commissioning. Please feel free to contact Fote Machinery, and we will customize production programs for you!